In the final days of the 2011 Egyptian revolution, the world gasped in disbelief as the administration of President Hosni Mubarak shut down access to the Internet and all mobile communications. At the time, it was inconceivable that a government would cut off people’s access to the internet and mobile networks. Since then, however, shutting down or disrupting internet connections or access to specific apps rarely makes the international news and has become a common tactic to control not just people’s speech but a range of issues. As many as 105 shutdowns or disruptions were recorded in 2017 alone, often coinciding with elections, violent conflict, and as we have seen in several countries in the Middle East and North Africa region, school exams. 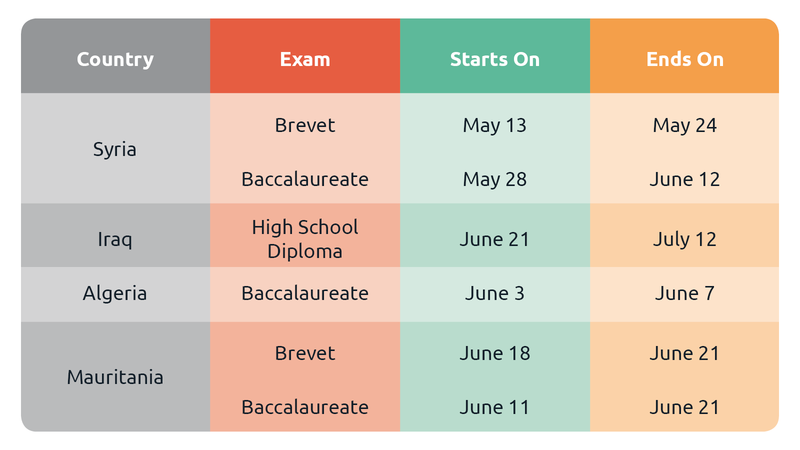 Since 2015, Syria and Iraq have regularly shut down the internet during end-of-the-year brevet and baccalaureate exams, Algeria followed suit in 2016, and Mauritania joined the club last year. These states justify exam-period shutdowns as a method to prevent cheating, and while it may work in some cases, exam questions still get leaked and offline cheating methods continue to be widespread. Meanwhile, network disruptions cause more serious problems. At a basic level, they prevent people from obtaining information, communicating with loved ones, or making online transactions. Many people find it difficult or even impossible to do routine work, especially in businesses that are dependent on internet access. In conflict areas, such as Yemen and Syria, Internet shutdowns limit access to emergency services and make it extremely difficult to report deaths and collateral damage, as we reported earlier this year. Internet shutdowns also incur economic losses on a broad scale. A 2016 Deloitte report estimated the impact of a temporary Internet shutdown in a highly connected country costs on average $23.6 million per 10 million people per day. Likewise, a Brookings Institute study spanning 19 countries and published in the same year found that internet shutdowns, almost half of which are in MENA, cost at least $2.4 billion in the global GDP. Members of the Transport, Transmission and Telecommunications committee of Algeria’s National Assembly acknowledged the disruption and potential danger caused by internet shutdowns. They have since tried to pressure the government to keep the internet on during national exams this year. While it remains to be seen if the government complies with their demands, such pre-emptive attempts to avoid shutdowns set a positive example for people facing shutdown of all kinds. With this in mind, this year SMEX has been experimenting with our own pre-emptive efforts to raise awareness about possible shutdowns and their negative effects. For example, we published an opinion piece earlier this year calling on the Turkish government not to use Internet shutdowns as a weapon against residents of the northern Syrian Afrin canton. 1. Share this article, follow @SMEX and retweet SMEX tweets that tell stories about the negative effects of shutdowns, like the one below: 2. 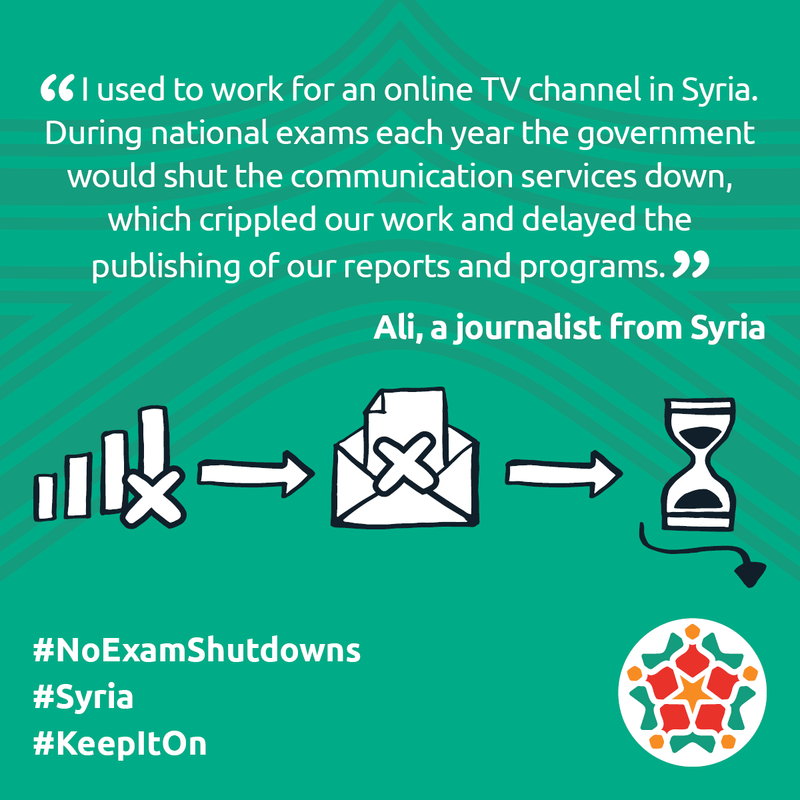 Refer to the table of exam times below and tweet before exam times about the disadvantages of Internet shutdowns using the hashtags #NoExamShutdowns and #KeepItOn as well as the targeted country (#Syria, #Mauritania, etc.). 3. If you or someone you know is negatively affected by a shutdown, share your story about the experience of dealing with an Internet shutdown. By working together to raise awareness about the potential for shutdowns before they happen, we want to pressure and lobby governments against using the internet as a tool of control. We hope you’ll join us.